When I ran for the Public Relations spot on Student Council at my local high school in June 1985, a couple of my female friends thought I needed to sport various looks to appeal to each segment of the school population. 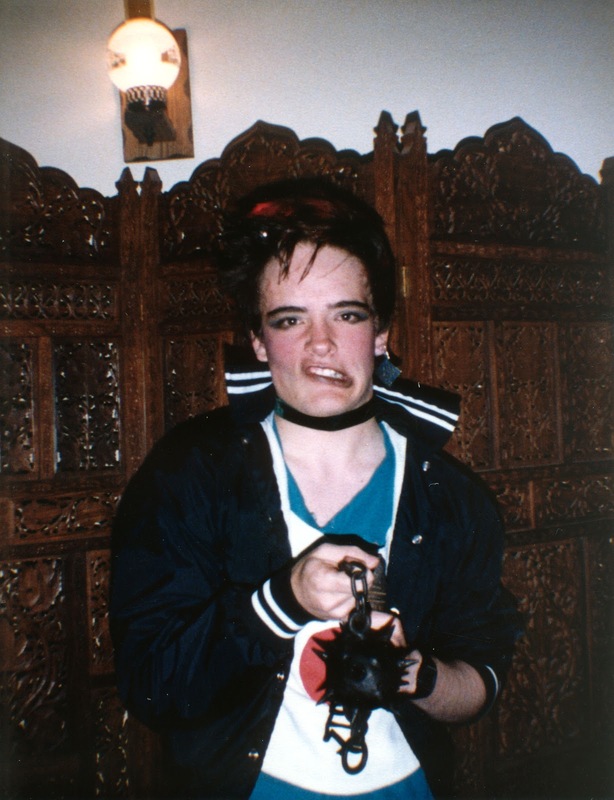 They helpfully made me up into a sort of combination Adam Ant/Billy Idol in an effort to garner the punk vote. I guess it worked, since I was elected to the position. Other posters featured me as a jock and a nerd, one of those being less of a stretch than the other. This is without a doubt the most spectacular photo you have ever posted. Hall Of Fame material. It will live on in the Internet for eternity! Long Live Punk Earl! Also, I am looking forward to this month's short story, which I fully expect to explain the narrative behind this picture. For example, what the blazes is a public relations spot on a Student Council? My high school experience was much less liberal, I guess, in that I don't recall there being a student council, let alone a PR flack for the Prez. In Catholic school, there's no council, you just take what you get and like it, no matter what you really think. Mostly it meant that I read the morning announcements over the PA system. That was a fun job.